How many Oceans touch Canada? How Many Time Zones does Canada have? Is abortion legal in Canada? Is Canada part of the United Kingdom? What are the Visa Requirements for Canadian citizens? 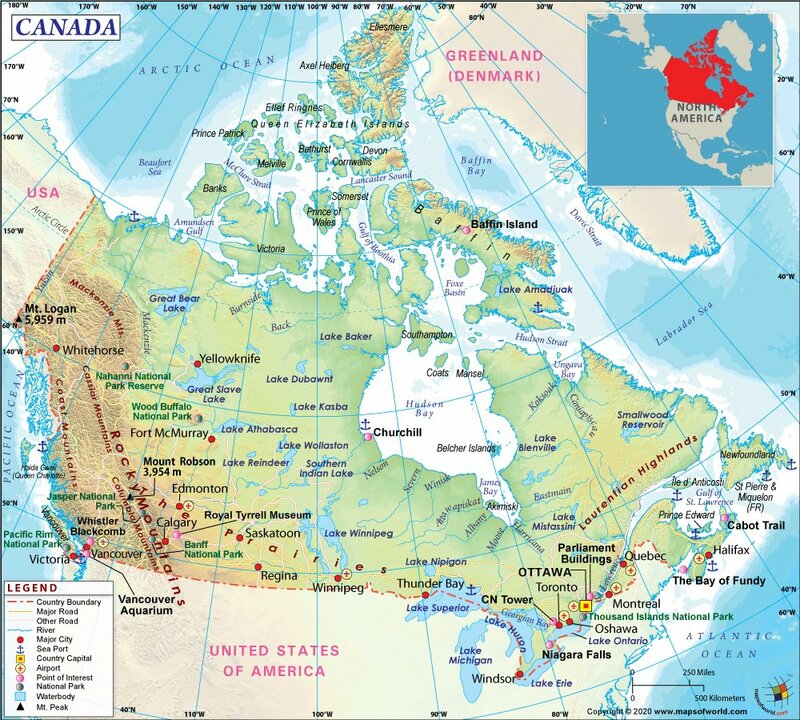 About Canada Map :- Covering an area of 3.8 million square miles, Canada is the second largest country in the world. This map of Canada shows international boundaries, the national capital, important cities, airports, major roads, rivers, sea ports, and other points of interest. Some of the major attractions in Canada include Niagara Falls, the CN Towers, Royal Tyrrel Museum, and Vancouver Aquarium…all are shown in this map. Major cities in Canada include Ottawa, Toronto, Montreal, Victoria, and Quebec City. Some of Canada's lakes are Great Bear Lake, Great Slave Lake, Lake Athabasca, Lake Reindeer, Southern Indian Lake, and Lake Nipigon. The Canada flag was adopted on February 15th, 1965, and is a combination of two red vertical stripes on each side with a red colored maple leaf adorning the central white strip. Red and white are the national colors of Canada. The history of Canada covers the period from the arrival of Paleo-Indians thousands of years ago, to present day. The native Indian people arrived thousands of years ago, across the Bering land bridge. With the arrival of European settlers, the world of the native population began to change, and many tribes did not survive the European contact, and died out completely. Pre-history ended with the arrival of the explorers in the 1490s. The French and British expeditions explored, and later settled, along the Atlantic coast. France ceded nearly all of its colonies in North America to Britain in 1763, after the Seven Years' War. In 1867, with the union of three British North American colonies, Canada was formed as a federal dominion of four provinces. What ensued was a process of increasing autonomy from the British Empire, which became official with the Statute of Westminster in 1931, and was completed in the Canada Act of 1982, severing legal dependence on the British parliament. Canada then constituted of ten provinces, three territories, and was governed as a parliamentary democracy and a constitutional monarchy with Queen Elizabeth II as its head of state. When the American Revolution ended, British attention in North America moved north consolidating various Canadian territories and uniting them. It was an age of great explorers such as Mackenzie, Thompson Fraser, and James Cook. This growth and consolidation was challenged by the United States during the war of 1812. But the newly formed country of Canada continued to resist the various American invasions. One of the most traumatic events for Canada, and the world was the First World War. The golden era before the war was a time of scientific discovery, social reform, and artistic innovation. When war broke out in Europe in August 1914, Canada, along with Europe, lost an entire generation and some of its finest youth. But out of this upheaval and disruption came one of Canada's finest moments and perhaps the first that defined it as a nation – The Battle of Vimy Ridge. The end of the war brought a period or readjustment, an outbreak of influenza, a new view of values, and the nationalistic euphoria of victory. October 1929 came as a shock to the Wall Street and to the economy of North America. Both United States and Canada sunk into the Great Depression. Along with this economic apocalypse came a climatic drought which destroyed farmlands. This drought lead to dried up land, and eventually much of the top soil blew away. Although Canada had gained control of its own foreign policy in 1931 from Great Britain, it was unreservedly committed to backing the Empire. As tensions in Europe rose in 1938 and 1939, Canada also prepared for war. Canada was to become the great training base for Empire countries and its navy grew to be the third largest in the world by the end of the World War II. WWII changed Canada in many ways…It ended the depression, pulled Canada onto the word stage, and set the stage for the longest and strongest economic boom in the nation’s history. Confidence and optimism were the watch words by 1945. Canada is located in the continent of North America. It is bound in the north by the Arctic Ocean, in the east by the North Atlantic Ocean, in the south by the United States of America (USA) and in the west by the North Pacific Ocean. Alaska, a US State, lies in its north-western part. Canada is the largest, among the various nations of the world that share an international border with only one country. The geographic coordinates of the country are 60 degrees 00 minutes north and 95 degrees 00 minutes west. The northernmost point of the country is Cape Columbia on Ellesmere Island in northwest territory, while the southernmost point is Middle Island in Lake Erie, Ontario, and the easternmost point is Cape Spear in Newfoundland, while the westernmost point is Mt. St. Elias, in the Yukon territory. Canada is divided into six time-zones. These are NST-Newfoundland Standard Time (UTC -3:30), AST-Atlantic Standard Time (UTC -4), EST-Eastern Standard Time (UTC -5), CST-Central Standard Time (UTC -6), MST-Mountain Standard Time (UTC -7), PST-Pacific Standard Time (UTC -8). Daylight Saving Time begins on the second Sunday of March and reverts to Standard Time on the first Sunday of November each year. With the clock set forward by 1 hour, the names of the time zones also change to NDT-Newfoundland Daylight Time (UTC -2:30), ADT-Atlantic Daylight Time (UTC -3), EDT-Eastern Daylight Time (UTC -4), CDT-Central Daylight Time (UTC -5), MDT-Mountain Daylight Time (UTC -6), PDT-Pacific Daylight Time (UTC -7) and YDT-Yukon Daylight Time (UTC -7). The total area of Canada is 3,855,103 sq. mi (9,984,671sq. km) and this makes it the second largest country in the world (Russia being the largest). Of the total land area, 91.08% is ‘dry,’ while the remaining 8.92% is covered by water. The Rocky Mountains, with their snow-capped peaks and their clear blue lakes are found in the western part of the country. The rest of the country is mostly covered with plains;however, lowlands are found in the southeast. Canada comprises varied landforms like mountains, plains, deserts, and fjords. The highest point in the country is Mount Logan which is 19,550 ft. (5,959 m) high while the lowest point is the Atlantic Ocean which is at sea level. Most of northern Canada has an arctic or subarctic climate with long harsh winters, short sunny summers and little precipitation,with mean temperatures below freezing for nearly seven months in a year. While the southern part of the country has a relatively milder climate, often experiencing high levels of humidity during the summer months and the temperatures rise above 85 degrees F (30 degrees C). The western and south-eastern part of the country can experience heavy rainfall, while the prairies are relatively dry. Most of the country’s rain and snow east of the Rocky Mountains is caused by cyclonic storms that form as a result of the mixing of air from the Arctic, Pacific, and North American interior. In general terms, four seasons can be distinguished in Canada, they are Spring (March to May), Summer (June to August/September), Autumn (September to November) and Winter (December to February or later). Canada has immense fresh water resources and almost 9% of its territory is water. An interesting fact about Canada’s hydrology is that nearly 60% of the country’s rivers flow and drain towards the north; away from the nearly 90% of its population which lives in the south. The major rivers of the country are the Athabasca, Columbia, Fraser, Mackenzie, Nelson, Ottawa, St. Lawrence, Saskatchewan, and Yukon. Of these, the Columbia and the Yukon cross the international border into the USA, while Mackenzie is the largest river of Canada. Canada has more lakes than any other country in the world, and more than 500 lakes in the country are larger than 38 sq. mi (100 sq. km). Some of the biggest lakes of Canada are Lake Superior, Huron, Great Bear, Great Slave, Erie, Winnipeg, Ontario, Athabasca, and Winnipegosis. Of these, the four which form a part of the great lakes-Superior, Huron, Erie, and Ontario are shared with USA. In Canada, about 71,000 species have been named and classified by scientists while it is believed that about 69,000 are yet to be recorded for the first time. Despite its northerly position, the country is rich and diverse in plant and animal life due to its large size. Boreal forests are the most common type of vegetation found in Canada; other flora includes Spruce, Fir, Birch, Pine, Maple trees, and gigantic Red Cedar, and prairie grasslands. Iconic fauna of Canada includes the Beaver, Bobcat, Canadian Lynx, Lemming, Polar Bear, Wolverine, Arctic Fox, Badger, Black Bear, Coyote, Moose, and Porcupine. Canada has designated 42 areas as national parks and national park reserves to preserve the country’s natural beauty, historic heritage and biodiversity. Some of the most visited national parks and reserves in the country are Cape Breton in Nova Scotia; Banff National Park in Alberta; Fundy National Park in New Brunswick; Gros Morne National Park in Newfoundland and Labrador; Gwaii Haanas National Park Reserve and Haida Heritage Site in British Columbia; Bruce Peninsula National Park and Fathom Five National Marine Park in Ontario; Forillon National Park in Quebec; Yoho National Park in British Columbia; Auyuittuq National Park in Nunavut, and Nahanni National Park Reserve in the northwest territories. Canadian food is highly dependent on the locally available ingredients, and hence, there is a wide variety of cuisine available as one travels across the country. Healthy and ethnic food rubs shoulders with the baked goodies and other comfort foods in the country. Canadian music reflects the country’s unique diversity–its strong English and French heritage, its pre-colonial aboriginal traditions as well as the influence of its immigrant populations. Although Canadian music has been heavily influenced by American music and culture; the close proximity between the two neighbors and the subsequent migration makes this inevitable, the country has nevertheless consistently produced musicians of international renown. Canadian art is a conglomeration of influences from different cultures across the world as well as its own pre-colonial aboriginal art. Before the advent of the first European settlers in Canada, indigenous art was primarily a confluence of the aboriginal culture and music with art itself. In the mid-19th century French Colonial art, largely in the renaissance period featuring religious depictions was patronized mainly by the Catholic Church. Some known painters of this period are Pierre Le Ber, Cornelius Krieghoff and Paul Kane. A group of landscape painters called the ‘Group of Seven,’ who came into prominence in the early 20th century, are debated to be the most influential artists in Canada’s history. Their art led to a surge of nationalism in Canada. The original members of the group were Franklin Carmichael, Lawren Harris, AY Jackson, Frank Johnston, Arthur Lismer, J.E.H MacDonald, and Frederick Varley. Canadian art achieved a distinct identity of its own only after the Second World War in 1945 when the government also played a vital role in the propagation of art. This was also the period when abstract art came into being in Canada. The origin of Canadian sculpture is known to be from ship-art, more specifically in the making and carving of ship mastheads. The first known sculpture in Canada was in New France in 1671 when sculptors were commissioned to do decorative work on a merchant vessel, the Canadien. For decades, naval sculpture remained the dominant form in which carpenters doubled up as sculptors and work was entirely in wood, although religious sculpture did follow suit. Other mediums for sculpture made their entrance only in the latter half of the 19th century. Some of the most inventive art in the realm of sculpting was made in Canada during the period between 1950-80. The period exposed sculptors to a great variety of new materials, and they responded with new kinds of constructions, multimedia works, installations and site-specific inventions, along with more traditional freestanding objects. Walter Allward, Jean-Paul Reopelle, Jordi Bonet, Lain Baxter, Sean Rooney, and Bill Reid, are some of the most noted sculptors of modern Canada. After the arrival of the Europeans, architecture in Canada was initially influenced by the Baroque and New England styles and later by the Victorian and Gothic Revival styles. The Château style was used in several public structures, such as the Supreme Court building. The desire for a unique Canadian style led to a revival of the Neo-Gothic style during the inter-war period. After the Second World War glass skyscrapers started dominating Canada’s skyline. Many Canadian projects of this period were designed by foreigners, who won open contests. Prominent Modernists such as Ludwig Mies van der Rohe and I.M Pei designed major works in Canada. At the same time top Canadian architects did much of their work abroad. Modern Canadian Literature can be predominantly divided into two categories–English and French literature, although in recent years immigrant literature from Canada has also made its mark internationally. The first writers in English were primarily travelers, explorers, British officers and their wives. The earliest documents were therefore, simply narratives of journeys and exploration. However, since Canada officially became a country in 1867, it has been argued that the literature predating this was colonial. In the 1960s, an experimental branch of Québécois literature began to develop. In 1967, the country’s centennial year, the national government decided to increase funding to publishers which gave further impetus to local literature. Prior to this, Canadian English literature was seen more as an appendage to British and American Literature. Booker Prize winning authors from Canada are: Michael Ondaatje, Margaret Atwood, and Yann Martel; while Alice Munro has won the Man Booker International Prize as well as the Nobel Prize in Literature. Like its art and literature, Canadian fashion was heavily borrowed and adopted from French fashion when the first European settlers started arriving in the country. Similarly, modern Canadian fashion is seen as more non-Canadian with more global influences. Some of the top fashion houses in Canada include LGFG fashion house, Greta Constantine, Pink Tartan, Smythe, and the top designers include Denis Gagnon and Jeremy Laing. Canadian cinema has been largely regional and niche in nature. Notable filmmakers from English Canada include David Cronenberg, Guy Maddin, Atom Egoyan, Allan King, and Michael Snow. Notable filmmakers from French Canada include Claude Jutra, Gilles Carle, Denys Arcand, Jean Beaudin, Robert Lepage, Denis Villeneuve, and Michel Brault. Predictably, like all its other art forms, Canadian Cinema is intricately linked with the cinema of its neighbor; the US. Canadian directors who are best known for their American-produced films include Norman Jewison, Jason Reitman, Paul Haggis and James Cameron. Canadian actors who achieved success in Hollywood films include Mary Pickford, Norma Shearer, Donald Sutherland, Jim Carrey, and Ryan Gosling. Many Hollywood films and television shows are filmed in Canada, although often un-credited. The sports popular in Canada include ice hockey, lacrosse, Canadian football, basketball, soccer, curling, baseball, golf, swimming, volleyball, skiing, cycling, and tennis. Ice hockey is the most popular spectator sport in Canada and is also its official winter game; while Lacrosse has Native American origins, and is the official summer game of the country. One of the most famous and dearly beloved of the Canadians in the last 100 years is Terry Fox, who had his leg amputated due to cancer, and since then he is honored as a secular saint of modern Canada. He organized a one man marathon across the country to raise funds for cancer research. Other famous Canadians include Dr. David Suzuki, scientist activist and media star; hockey player Wayne Gretzky; Marc Garneau, the first Canadian in outer space; non-fiction author Pierre Berton, and Nobel Laureate in Medicine for his research in Diabetes, Dr. Frederick Banting. The most internationally renowned Canadians hail from the world of cinema and music and include singers Bryan Adams, Celine Dion, Neil Young, Shania Twain, Justin Bieber; actors Keanu Reeves, Michael J Fox, William Shatner, Jim Carrey, Ryan Gosling, Ryan Reynolds, Ellen Page, Donald Sutherland, Pamela Anderson; director James Cameron and many more. The fiscal year in Canada begins from April 1st, throughMarch 31st. As per the year 2016 estimates, agriculture contributed 1.6%, industry contributed 27.7% and the service sector contributed 70.7% to the gross domestic product (GDP) of the country. As per the year 2006 data, 2% of the labor force in Canada was engaged in agriculture, 13% in manufacturing, 6% in construction, 76% in services and 3% in other activities. Agricultural products of the country include wheat, barley, oilseed, tobacco, fruits and vegetables; dairy products; fish and forest products. Industries in Canada include, transportation equipment, chemicals, processed and unprocessed minerals, food products, wood and paper products, fish products, petroleum and natural gas. Natural resources found in Canada include iron ore, nickel, zinc, copper, gold, lead, rare earth elements, molybdenum, potash, diamonds, silver, fish, timber, wildlife, coal, petroleum, natural gas, and hydro-power. Total exports for Canada were estimated at USD 462.9 billion in the year 2012. The country mostly exports motor vehicles and parts, industrial machinery, aircraft, telecommunications equipment; chemicals, plastics, fertilizers; wood pulp, timber, crude petroleum, natural gas, electricity and aluminum. Its main export partners are USA, China, and United Kingdom. Total imports into Canada were estimated at USD 474.8 billion in the year 2012. The country mostly imports machinery and equipment, motor vehicles and parts, crude oil, chemicals, electricity and durable consumer goods. Its main export partners are USA, China and Mexico. With about 647,655 miles (1,042,300 km) of roads Canada has the fifth largest road network in the world. The only inter-provincial systems are the Trans-Canada Highway and National Highway System. Canada’s national highway system is made up of over 23,625 miles (38,000 km) of important national and regional highways. Canada has one of the largest railway network in the world, with 30,709 miles (49,422 km) of railway tracks. The Canadian National Railway Company, headquartered in Montreal, is the largest railway in Canada, in terms of both revenue and the physical size of its rail network. It is Canada's only transcontinental railway company, spanning Canada from the Atlantic coast in Nova Scotia to the Pacific coast in British Columbia. With a total of over 1,450 airports Canada is ranked number four in the world. The busiest airports in Canada are Toronto Pearson International Airport, Ontario; Vancouver International Airport, British Columbia; Montreal Pierre Elliott Trudeau International Airport, Quebec; Calgary International Airport, Alberta; Edmonton International Airport, Alberta; Ottawa Macdonald-Cartier International Airport, Ontario; Halifax Robert L. Stanfield International Airport, Nova Scotia; Winnipeg James Armstrong Richardson International Airport, Manitoba; Victoria International Airport, British Columbia and Kelowna International Airport, British Columbia. One of the most important waterways of Canada is the Great Lakes and the Saint Lawrence River water system which connects the country’s heartland to the Atlantic Ocean and serves 15 major international ports. The major ports of Canada are made up of 18 Port Authorities which together comprise the National Ports System. Important ports of the country are Fraser River Port, British Columbia; Port of Halifax, Nova Scotia; Port of Montreal, Quebec; Port of Port Cartier, Quebec; Prince Rupert Port, British Columbia; Port of Quebec, Quebec; Port of Sydney, Nova Scotia; Port of Toronto, Ontario and Port Metro Vancouver, British Columbia. The main oil terminal of the country is Lower Lakes Terminal in the Saint Lawrence River. As of the current data for the year 2013 Canada has 21 operational satellites in space. Out of these, two are civil satellites, one is a civil/commercial satellite, 14 are commercial satellites, three are government satellites, and one is a military satellite. The international country code for Canada is 1. There were 15.902 million telephone main lines in use and 29.39 million mobile cellular connections in the country as per the year 2015 data. The internet country code for Canada is ‘.ca,’ and as per the year 2015 data there were 31.053 million internet users in the country. Based on the 2011 census, the 10 most populated cities of Canada are Toronto, Ontario; Montreal, Quebec; Vancouver, British Columbia; Ottawa, Ontario/ Quebec; Calgary, Alberta; Edmonton, Alberta; Quebec, Quebec; Winnipeg, Manitoba; Hamilton, Ontario and Kitchener, Ontario. Which form of government does Canada have ? Canada is a parliamentary democracy, a federation, and a constitutional monarchy. Who is the head of state in Canada ? Head of state is Queen Elizabeth II. She is represented by Governor General David Lloyd Johnston. Who is the head of government in Canada ? How many provinces does Canada have ? When is Canada’s National Day ? Canada Day is celebrated on July 1. It commemorates the formation of Canada as a Dominion on July 1, 1867 by the British North America Act, or Constitution Act. What currency is used in Canada ? Canadian dollar is the currency of the country. What is the population of Canada ? Which are Canada’s largest cities by population ? What are the official languages of Canada ? How big is Canada ? Canada is spread over an area of 3,854,085 square miles or 9,984,670 square kilometers. It is the second largest country in the world. What is the origin of Canada’s name ? The name “Canada” comes from the First Nations (the aboriginal people of Canada) word for “settlement” or “village”. Where is Canada located ? Canada is located in northern North America. It covers 41% of the continent, and shares the longest border in the world with the United States. Which oceans border Canada ? How many time zones does Canada have ? Canada has six time zones. These are: Newfoundland, Atlantic, Eastern, Central, Mountain, and Pacific. What are the major mountain ranges in Canada ? Which are the major rivers in Canada ? Which is the largest Canadian province ? Quebec is the largest Canadian province. Which is the smallest Canadian province ? Prince Edward Island is the smallest province. What are the official national colors of Canada ? Red and White are the official national colors of the country. The red is from Saint George’s Cross, and the white is from the French royal emblem. What does the national flag of Canada look like ? The Canadian flag is red with a white square and a red maple leaf in the center. The maple leaf symbolizes nature and the environment. What are the capitals of the Canadian provinces ? What is the Canadian National Anthem ? 1. Canada’s Yonge Street is the longest street in the world. It is spread over 1, 896 kilometers. 2. Basketball was invented by a Canadian-American James Naismith. 3. Canada got its name by mistake. French explorer Jacques Cartier came in contact with the local natives of the region who invited him to their village, known in local terms as kanata. He mistakenly thought that the name of the country was Kanata or Canada. 4. Quebec's Hôtel de Glace is the only Ice Hotel in North America. 5. In 2011, the national treasury of Canada released a new $100 bill, which people complained had the scent of maple syrup. 6. A.A. Milne’s stories about Winnie-the-Pooh were inspired by a black bear cub from Canada named Winnipeg (or “Winnie,” for short). 7. Canada is the second largest country in the world after Russia. 8. Quebec is Canada's largest French-speaking province. 9. The Canadian town of Churchill is home to the world’s only prison for polar bears. 10. The postal code of Santa Claus is H0H 0H0. The mailing address is assigned to Santa by Canada Post. Every year, the postal service responds to millions of children's letters from around the world addressed to Santa Claus, North Pole, H0H 0H0, Canada. 11. The 5,525 mile long US-Canada border is the longest undefended international border in the world. 12. The moose and caribou are Canada’s most recognized national symbols.